Rim area ﬁre detection & suppression systems designed to provide a rapid ﬁreﬁghting measure, used to detect and suppress ﬁre events when occurring at the rim area of ﬂoating roof storage tanks, in early stages before creating a developed ﬁre event. Worldwide studies show the causes of a ﬁre event on ﬂoating roof storage tanks can be caused by absence of adequate detection system to trigger a ﬁxed suppression system. RAFP systems should not be considered as a primer ﬁreﬁghting system to protect open top ﬂoating roof systems because of their limited autonomy. The system works fully pneumatically-mechanically and for its function, no external power is needed. The detection system consists of certiﬁed pneumatic tubing kept under pressure which bursts at a predetermined temperature and triggers oﬀ the extinguishing system via a special balancing valve. The extinguishing system consists of a pressure vessel containing premixed foam solution kept under pressure of nitrogen or compressed air thanks to special a balancing valve located on the upper part of the system. This special valve has a critical function using the pneumatic detection system's stand-by pressure to keep the system ready. When the pneumatic detection system detects a ﬁre event, the pressure drop changes the balance of the system valve and the extinguishing agent is released from the ﬁxed stainless steel piping and nozzles positioned at the rim area. 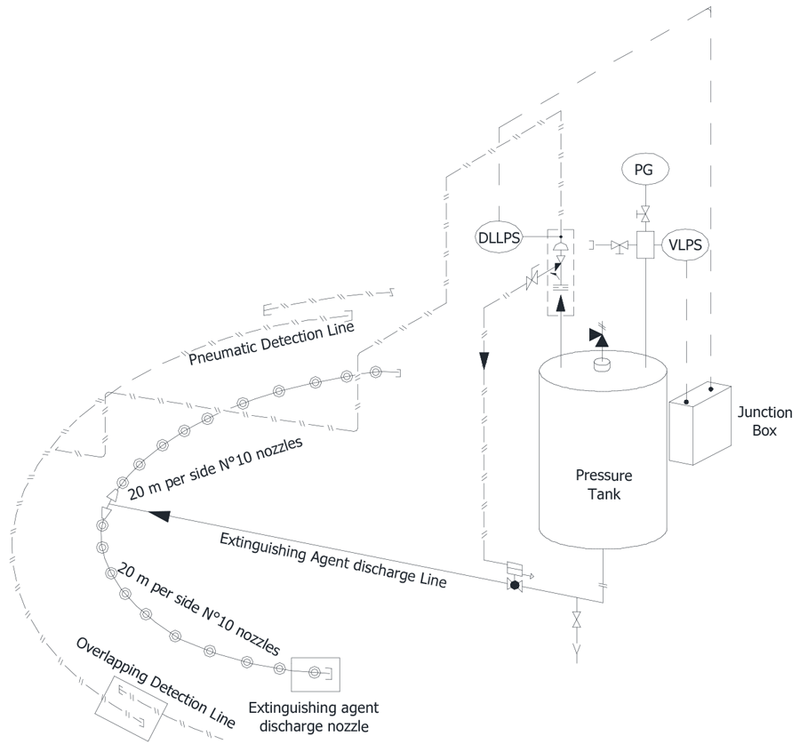 Each RAFP system protects 40 running meters of a storage tank rim area. The system is equipped with ATEX certiﬁed pressure transmitters to supervise system readiness simultaneously. C.S.I. S.r.l. constructs RAFP vessels with CE mark. C.S.I. S.r.l. presents the new product line as means of automatic detection & extinguishing systems to be used in floating roof tanks to protect Rim Seal area. As known, for floating roof tanks the fire risk is accumulated at the rim seal area because of that’s construction nature. Vapour of the stored product creates a highly flammable mixture with ambient air. Any external ignition source in any point at this area may result with a fire which may affect all the seal area if not detected & suppressed in earlier stages. Most important firefighting action to fight against a rim seal fire is to detect the fire. The rim seal area is hidden by the tank wall and that is not so easy to detect the fire at the earlier stages with conventional detection systems. At conventional extinguishing systems are triggered by means of several detectors and detection logic to operate some valves etc. to start the active extinguishing systems. C.S.I. RSFP system is self-sufficient to detect any fire at the exact point with its pneumatic detection system and extinguish simultaneously discharge of the extinguishing agent to the rim seal area with pre piped discharge nozzle/piping system. C.S.I. RSFP systems are used to protect approximately every 40 meters of circumferential length of rim seal area. Modular systems are located over the floating roof with an overlapping manner of the detection line to cover all the area. After installation of the detection and the extinguishing lines, system should be pressurized by using the pre load kit available on request. As the functioning principle of the system, the pressure tank and the detection tubing will be pressurized to a predetermined value. The “differential pressure multivalve” is a special valve which is kept normally close by the balance pressure of the tank inside and the pneumatic detection line. The pneumatic detection line consist of a thermoplastic tube with certain certifications to burst under specific pressure and temperature level. In case of detecting a fire at the rim seal area, the pneumatic detection tubing will burst and change the balance of the differential pressure valve which triggers the pneumatic actuated extinguishing agent control valve to open. When the discharge valve is open, the extinguishing agent is discharged through the nozzles located along the circumference of the tank which extinguishes the fire and creates a protection blanket. 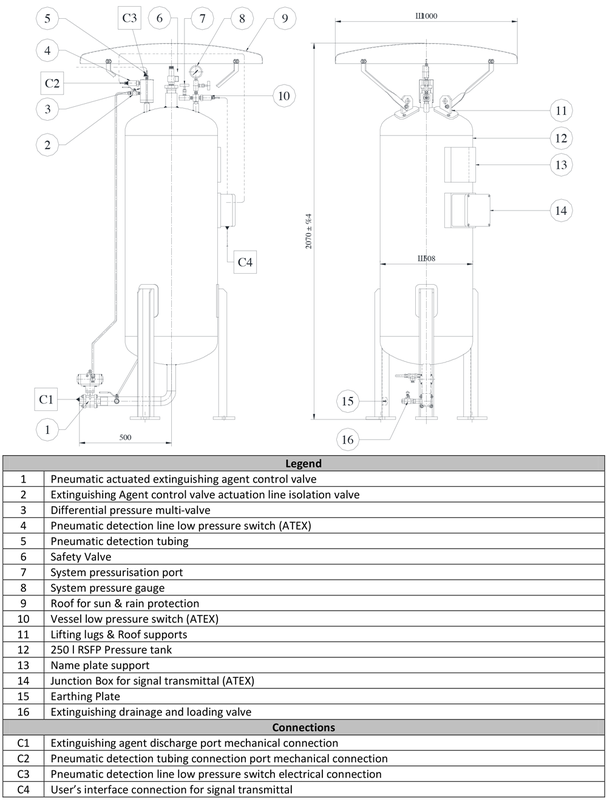 As an option, the pressure vessel could be pressurized in case of any pressure failure at the detection line by an external cylinder systems. Please consult to C.S.I. for further information. Rim Seal Area Protection system pressure vessels are object to PED certification with notified body. C.S.I. S.r.l. is holder of H1 certificate according to PED and in possession to mark the products with CE mark. Max total weight of the pre-loaded system 380 kgs.